DentalWriter™ is the industry standard Narrative Report Writing & Medical Billing Software for Dentists that has helped thousands of dental practices implement dental sleep medicine, TMJ treatment, and other services a dentist can bill to medical insurance. Implement Dental Sleep Medicine & TMJ Treatment services, staying organized & saving time. Maximize medical billing reimbursement for Dental Sleep Medicine, TMJ, & Oral Surgeries, & other services to increase case acceptance and revenue. Establish physician referral networks to acquire new patients and grow your practice. With the easy step-by-step flow of DentalWriter™ and our unparalleled support & training, your practice can operate a streamlined protocol for each case, increasing your efficiency and revenue for dental services eligible for medical reimbursement. 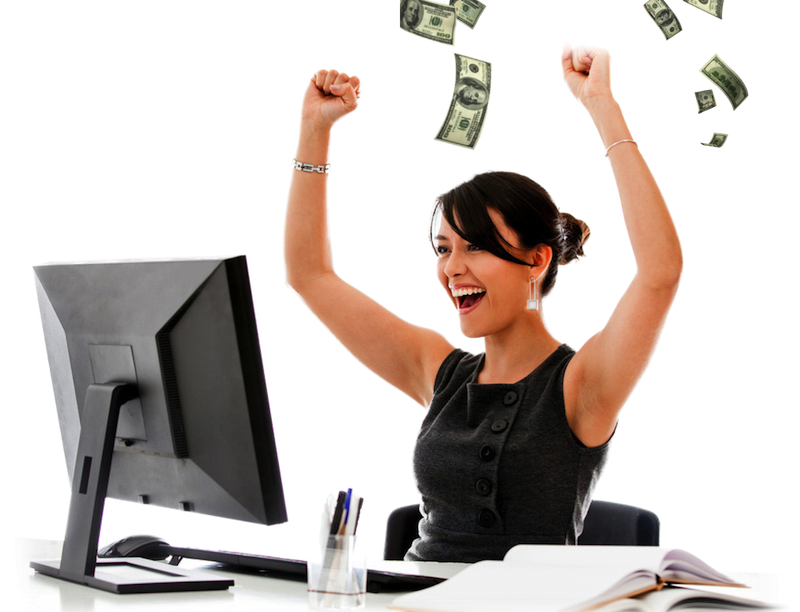 With a few clicks, DentalWriter™ transforms you into a master of the medical billing process! After the patient completes the DentalWriter™ online questionnaire, and your practice completes the exam in the software, DentalWriter™ will intelligently populate the medical claim form (that you can send electronically), and generate your detailed narrative reports (in S.O.A.P. 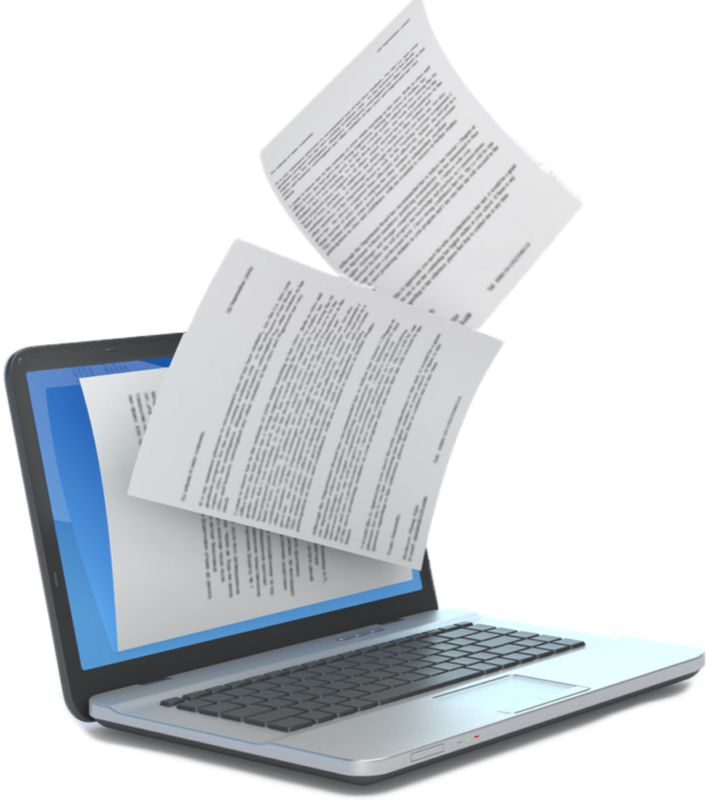 format) that will serve as your communication to the various referring physicians, and documentation for medical reimbursement success! It ensures you have the proper documentation to obtain and retain medical reimbursement and physician referrals all while saving time and providing an easy and customizable process to follow. Let DentalWriter™ do the work for you and focus on what you do best, quality patient care. 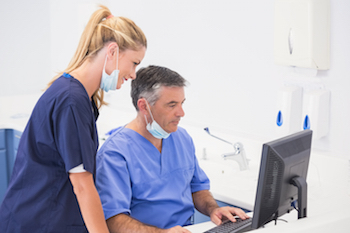 In addition, by utilizing the interactive checklist – DentalWriter™ Navigator, you can streamline your protocols for each case, ensuring you never miss a step. Generate the various Quickletters™ you need for each case right from the Navigator, including informed consents, financial policies, and physician referral letters. Easy! There is a Quickletter™ for your every need (over 250)! DentalWriter™ keeps you organized, efficient, and saves hours of time per case, while the unmatched training & support gives you the tools needed to tackle the integration of dental sleep medicine, TMJ disorders, and medical billing in your dental practice. It is time to get your ducks in a row with DentalWriter™. For 27 years, our dedicated team of industry experts has been the secret to our success. DentalWriter clients receive unparalleled training and support on the software, AND on medical billing and clinical protocols for dental sleep medicine, TMD treatment, and oral surgeries, through online study clubs and webinars, daily live training, and a 24/7 on-demand database of education resources. Tailor your questionnaires, exam forms, follow-ups, and array of template letters to your exact flow. With DentalWriter™ software, you can easily customize any form, or use the default options that have become the standard for dental sleep medicine and TMJ disorder treatment Diplomates. Modules for: Dental sleep medicine, TMJ disorders, Oral surgeries, Dental implants and related procedures, Perio, & More. CrossCode™ Online Software: Easily search ICD-9 & ICD-10 (diagnosis), CPT & HCPCS, and CDT codes with descriptions, cross-codes, average fee ranges, as well as over 90 dental-medical case examples and reference sheets. See more about CrossCode™ Online here. 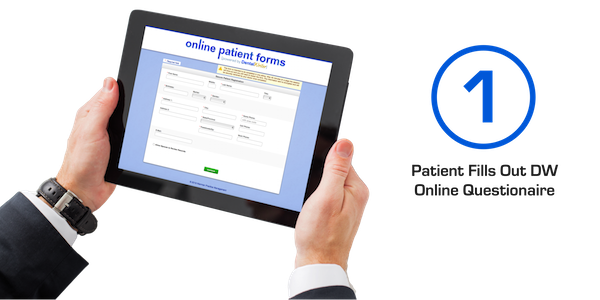 Web-based patient questionnaire data instantly imports into your DentalWriter to save you time and double-entry. Smooth workflow for each step of your treatment process. Data from the exams creates your diagnostic reports and links codes to the medical claim form. Access over 250 template letters for your every need in dental sleep medicine, TMJ disorders, and medical billing in dentistry. From financial & treatment consent, to marketing, referrals, insurance appeals & so much more. Streamline your production and increase your rate of reimbursement success, with patient, insurance, practice information, and ICD-10 and CPT codes automatically populating. Send your claims electronically right from DentalWriter™ through our 3rd-party clearing house APEX-EDI. 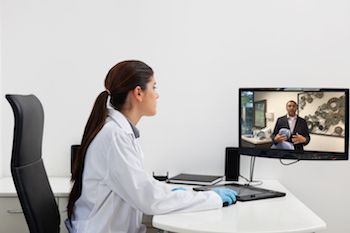 The perfect solution for practices that work from multiple locations, or maintain their administrative and/or billing departments outside of the practice. Securely send, receive, digitally sign, and scan HIPAA compliant faxes right from DentalWriter™. Eliminate double entry of patient data by linking to over ten major dental softwares. Being a DentalWriter™ client comes with more than just the leading software for implementing sleep apnea, TMJ, and dental-to-medical billing. You gain the unparalleled training and support that will help take your practice to the next level. Medical billing in dentistry is constantly changing, and we are on top of it! Your DentalWriter™ software is reguarly updated for changes to medical coding & billing guidelines, such as ICD-10 diagnosis codes, as well as software feature improvements and additions. Our technical support team is readily available to assist you with anything from installation to troubleshooting to ensure a smooth and easy experience. Participate in live study clubs every month and enhance your knowledge from our renowned faculty. Also explore our invaluable library of over 60 hours of continuing education videos from the dental medical cross coding, dental sleep medicine, and TMD industry’s top opinion leaders, including Rose Nierman, Dr. Mayoor Patel, DDS, and more. 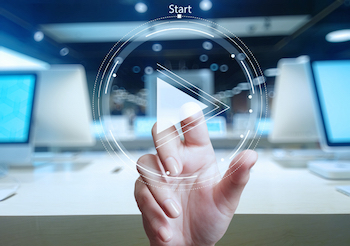 Receive the individual attention you need to help maximize the value of your DentalWriter software with our daily live training webinars – all you need is an internet connection! Our team of industry experts specialize in medical billing for dentists, (dental to medical cross coding), as well as sleep apnea, TMD, and craniofacial pain implementation utilizing DentalWriter™ software. They make themselves available throughout the week so your practice can receive the individual attention needed to successfully implement medically necessary services. Over 90% of DentalWriter clients choose to renew each year because of the renowned support they receive. Learn and train at your own pace with our impressive library of over 20 hours of software and protocol training for medical billing in dentistry, sleep apnea, TMD, and oral surgery implementation. Continuing the trend we started in 1988, we are always on the forefront of industry updates and guideline changes. Our experts keep your practice in the know with consistent updates and an easy-to-access knowledge base. 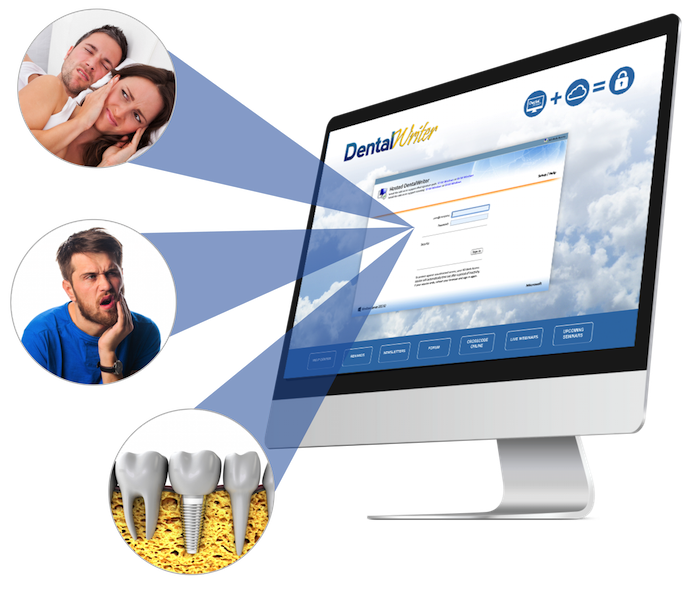 Included with DentalWriter, CrossCode Online Software is a powerful tool that allows you to quickly cross code between dental and medical codes. See more about CrossCode™ Online here. or you can also request a Live Demo! 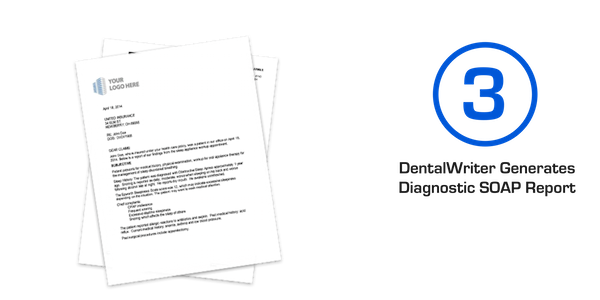 What are the System Requirements for DentalWriter Software? Microsoft SQL Server Express edition supports databases up to 10 GB. Options are available for purchase from Microsoft to further the capacity if needed. See “Database Capacity” on page 3. 4 GB Minimum. Recommended if running multiple workstations or if DentalWriter is sharing a server with other applications. More memory generally means a better DentalWriter experience. 100%. If display settings are “magnified” or set to something larger than 100%, the user may be unable to see the full DentalWriter application. Conflicting Software Microsoft SQL Server Desktop Engine. See the full system requirements and technical specifications. What Procedures Can a Dentist Bill to Medical Insurance? Successfully billing medical insurance in a dental practices depends on several factors. First and foremost, the procedure has to be covered under the patient’s specific medical plan and policy. Second, there must be proper documentation showing that the procedure was medically necessary. Depending on the written policy, some insurance companies may require additional information in order to be approved, such as a physician’s written order or prescription. Third, the medical claim form needs to be filled out properly, with the correct ICD diagnosis codes, and CPT procedure codes. What is Needed to Bill for Dental Sleep Medicine? Dental sleep medicine billing is the process of submitting medical claims for oral appliance therapy that treats obstructive sleep apnea (OSA). Medical insurance and Medicare typically reimburses for oral appliance claims when claims are submitted with the right documentation. In fact, there are no dental codes for OSA, leaving medical insurance as the appropriate billing source for dental sleep medicine services. Dental practices can bill for a custom oral appliance, exams, and radiographs related to the treatment. In order to receive medical insurance reimbursement in dental sleep medicine, you need several pieces of information to complete the puzzle. Medical billing for dental sleep medicine is not difficult once you figure out the proper protocols. The diagnosis of obstructive sleep apnea by a physician. A written order or prescription for an oral appliance from physician. Patient questionnaire that includes medical history, Epworth Sleepiness Scale, and sleep history. Detailed documentation or narrative report of questionnaire data and exam findi/ngs. Dental Sleep Medicine Billing is made easy with DentalWriter software. Our clients report over a 95% success rate when billing for sleep apnea appliances. If I Utilize a Third-Party Medical Billing Service, Do I Need DentalWriter? The key to successful medical billing in a dental practice lies in detailed documentation and narrative reports. 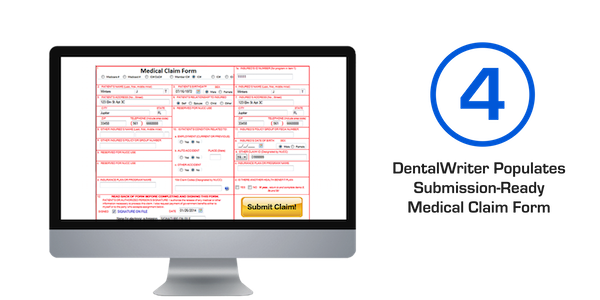 Dental practices with a medical billing service and DentalWriter™ stay organized, save hours of time per case, and access essential documentation, forms, and narratives to successfully Implement medically necessary services. The narrative reports that DentalWriter™ generates from each patient visit serves as your documentation and your communication to physicians, which greatly increases your referrals and help grow your dental sleep medicine and TMJ disorder services. In addition, DentalWriter™ simplifies and streamlines the workflow with the electronic questionnaire and exam forms, and the library of Quickletters over 150 template letters and forms for all of your communication needs. How Often is DentalWriter Software Updated? 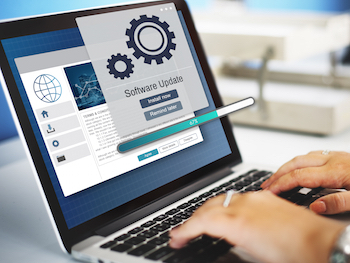 Our development team typically releases 2 major software updates a year. These updates include changes to medical billing codes or protocols, such as the updated ICD-10 diagnosis coding set put into effect October 2015. Updates also include new features, such as our benefit checker and ledger, as well as enhanced technology, such as our Secure Fax add-on option. Is DentalWriter Compatible with Mac? The Desktop version of DentalWriter is only compatible with a Windows operating system. 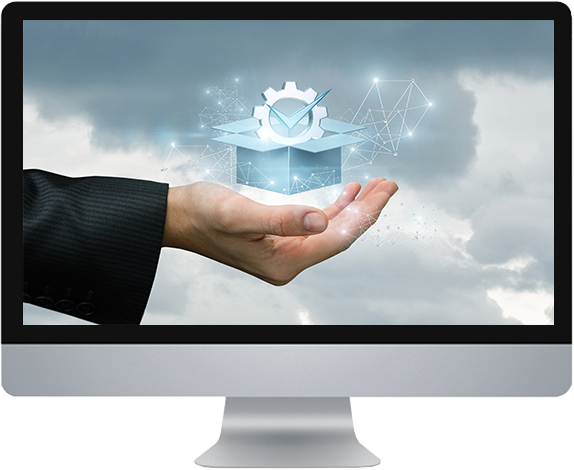 However, The DentalWriter Private Cloud version is compatible with Mac operating systems since it is accessible through an internet browser. 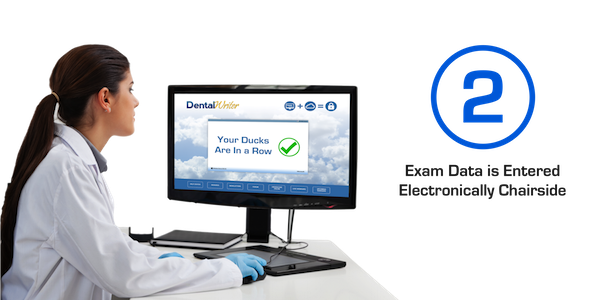 Get your ducks in a row with DentalWriter™ today and start taking advantage of medial reimbursement in dentistry!